He replied, “Of course not, totally safe – Nothing to worry about.” Definitely comforting words from a pilot, but what happened next was even better… He sent a weather map showing where the turbulence was and said, based on where you are, the turbulence will be over in a few minutes. A live data weather map with turbulence and pilot reports! We decided to roll our own for fun and as a way to test the NOAA API. 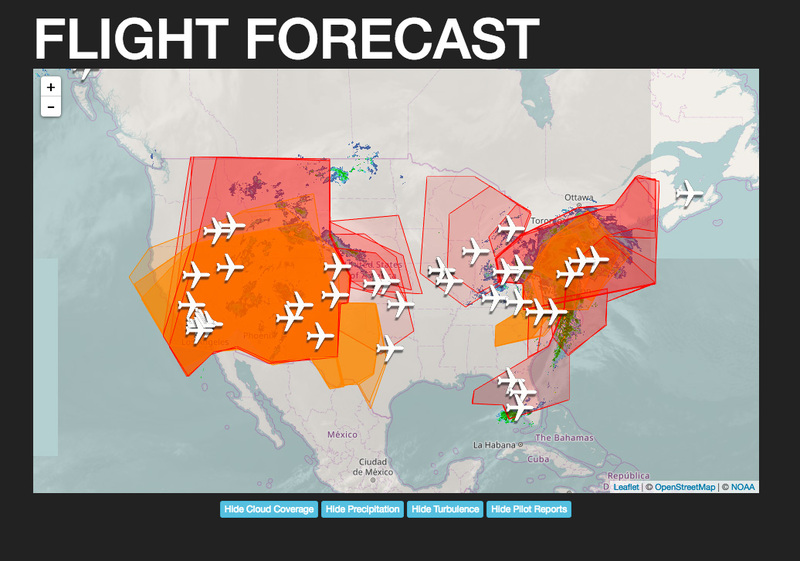 Flight Forecast is a combination of OpenStreetMaps, weather map overlays and live data pulled from the NOAA API which includes turbulence areas, detail and pilot reports of turbulence. Check it out on your next bumpy flight!